This is the first post in a series that Metadium Team is putting together to discuss how identity and blockchain impact various industries. In the modern world an individual’s education is an integral part of his/her identity. Your alma mater can tell a lot about what type of person you are and what chances you may have for the future. Today we’d like to talk about how blockchain makes that part of your identity verifiable and reliable. Now, education can mean a lot of things, so we will narrow the scope to higher education (university level and beyond). The majority of people go to university to get the diploma. A diploma is required if you want to land a good job, and let’s be sure to stress on good here. So what happens after you get that certificate of graduation? You start looking for a job. Today the job application process is long and stressful by itself: multiple resume revisions, numerous cold emails and rejections, various interviews and face-to-face tests. Not to mention you have to verify all the documents you submit which includes your diploma, transcripts, and other certificates. In 2017, in South Korea alone, 48% of job seekers sent at least one electronic certificate to one company. This amounted to 7,300,000 won in service fees.This results in time spent, plus financial burden, plus negative environmental impact (energy used, paper sent, etc.). Blockchain technology addresses these issues. Universities can use it to manage student records and credentials in a transparent and permanent way, to protect intellectual property of its researchers and faculty members, and even to receive tuition and other payments in cryptocurrency. The exciting part is that this transition toward using blockchain technology in education is already underway. Today, Coinplug, our technology partner, announced that a consortium has been formed together with seven other major companies in the telecommunication, finance, and media industries to tackle the challenges of ID/authentication. Coinplug will focus on developing a service to provide transcripts and certificates of graduation using the Metadium blockchain starting this year. 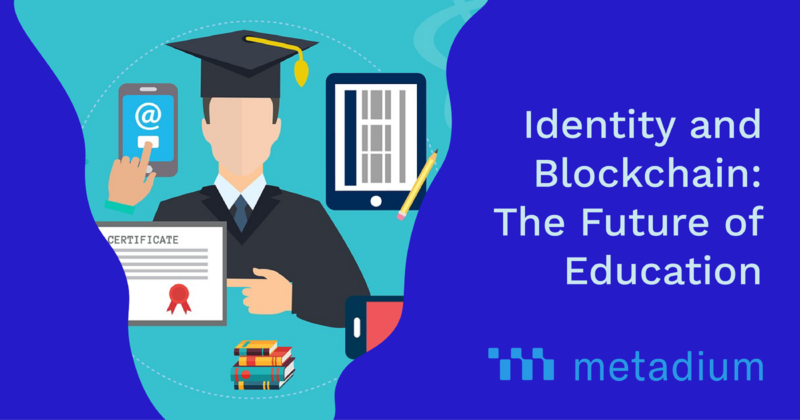 In addition to transcript and certificate attestation the Metadium blockchain has the potential to support a whole ecosystem for higher education providers through its claim and achievement incentive mechanism in the near future. This mechanism will make the whole ecosystem interact and develop. A claim is an action based on an individual attribute designed, verified, and issued by network participants or entities. An achievement is a reward system triggered by a single or a set of claims to foster interaction within the Metadium blockchain ecosystem. We live in a world where most of the time, especially in times when it matters the most, saying who we are is not enough. We are constantly required to verify our identity. This same phenomenon of requiring perpetual verification applies to almost all pieces of your identity. Metadium focuses on this every day “use” of identity. Our Metadium Partnership Program aims to build an ecosystem where various industry players develop and cooperate to improve the ID/authentication processes. Education, albeit of great importance, is only one area of application. Any individual or entity can assess the full potential of the Metadium blockchain by exploring all its features and possibilities. We would be thrilled to have you contribute to its, and our, further development. *This is a scenario that was created to give you a better understanding of Claim and Achievement incentive mechanism that is currently under development. It is not related to consortium and its activities. This article is the first in a use case series the Metadium team is putting together for you. If you want to learn more please follow us on Facebook, Twitter, Instagram, and LinkedIn! Keepin App is available on the App Store and Google Play.